Description: This Scottish-style ale is part of Granville Island’s Black Notebook Series – a series of small-batch, limited-release beers. In honor of Robbie Burns Day, this beer is brewed in the traditional Scottish Ale-style, consisting of darker, richer malts that are subjected to a longer boil and a mild hopping. Tasting Notes: Like most of GI’s Black Notebook Series, this brew was a somewhat subdued, but definitely landed in the requisite flavor departments. These included the darker, heavier malt base, the notes of sugar and dark fruits, and the hint of peat moss and general smokiness. Definitely a solid Scottish Ale for those who want a milder variant. 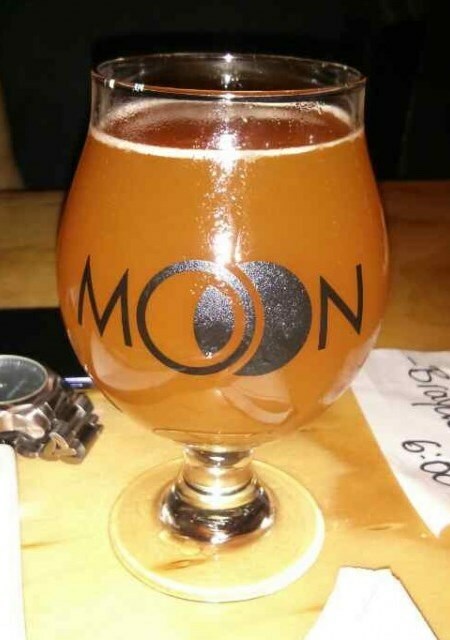 In honor of their first year since the new ownership took over, the Moon Under Water brewpub chose to release this limited reserve wheat wine. And I finally got my bottle! Not that long ago, I wandered into their operation for the first time and got to meet some of the management. They seemed like a family that was seriously committed to craft beer, so when they chose to release their first anniversary brew, I knew I had to have some. And I have to say, red wheat wine is really quite interesting. I’ve had my share of interesting brews in the past. Much like a barleywine, it is darker in color due to its high gravity and heavy malts, and is unfiltered. It’s also generously flavored with Citra hops and fermented dry with three different strains of yeast. What results is a beer that is a deep orange-red, is cloudy to the point of being opaque, and very strong (11.5% alc/vol). My one complaint about this beer is the amount of yeast found within. Once I poured this bad boy into a tall glass, I noticed quite a bit of floating cultures! But that’s to be expected from a beer of this strength, and one that’s unfiltered! All in all though, this was a VERY not bad first year for Moon Under Water. I sincerely hope they choose to greet fall and the coming of winter with a brown, a stout, a barleywine and/or a straight bock. Not that their lineup particularly needs these, I would just be interested to see what they would do with them. If there’s one thing they’ve demonstrated a knack for, its experimentation!